Sometimes you look at what’s in the fridge and an idea strikes. And sometimes that idea even works! I found eggs, the dwindling end of a wedge of parmesan, a few stalks of asparagus and some sliced ham. Sounded like the makings of breakfast. I usually do an omelette with whole stalks of asparagus, ham and Swiss cheese. I didn’t have an even number of asparagus stalks and I didn’t have Swiss cheese, so I thought why not shave the asparagus and sauce it in a little butter? Lesson learned: my hand held mandoline is not the best way to shave asparagus. A vegetable peeler works much better. I cut one thick stalk in half lengthwise for garnish, shaved the rest and cut the shavings into two inch pieces. A brief sauté in butter tenderized and flavored the asparagus. I beat two eggs until the yolks and whites were blended and then swirled the eggs in a dab of butter until they coagulated and firmed up – a take on Julia Child’s French omelette method. Instead of putting the topping on a pile of swirled eggs, I did the filling on half the firmed egg in the pan, folded it over and slipped it on to a plate. I added the garnish asparagus and big shavings of parmesan. Some hot buttered toast on the side and it was breakfast! More like a weekend breakfast than a weekday meal, but oh, so good! 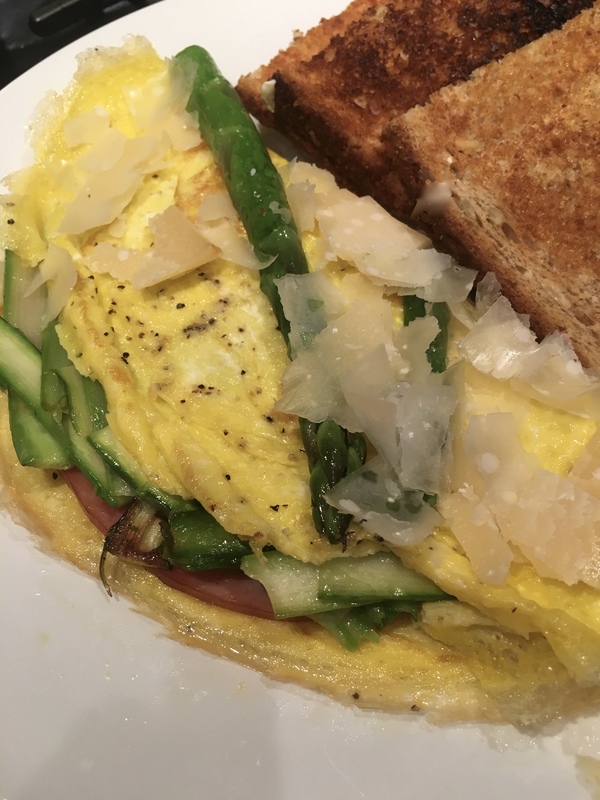 Ham, asparagus and parmesan omelette. Can spring be far away? I’ve been looking at tuna steaks and the other seafood at the market. Last night, I could resist no longer so I picked up a pair. Of course, I needed a couple of sides, so I grabbed baby bok choi and went looking for a pseudo-asian boxed rice mix. Instead, I found a boxed Pad Thai noodle bowl that I split into two servings. When I do tuna steaks, I pick up a packet of wasabi mix crackers and peas and other interesting crispy things I have yet to identify. I run them through a mini-food chopper until they are coarse crumbs. I press both sides of the tuna steaks into the crumb mixture and pan sear them. I get a nice crunchy crust with a hint of wasabi kick that compliments the tuna. Tuna steaks on the griddle pan. The first side crust browned nicely. Pad Thai noodles, tunia steak and steamed baby bok choi. Better than the Grand China Buffet versions for sure! 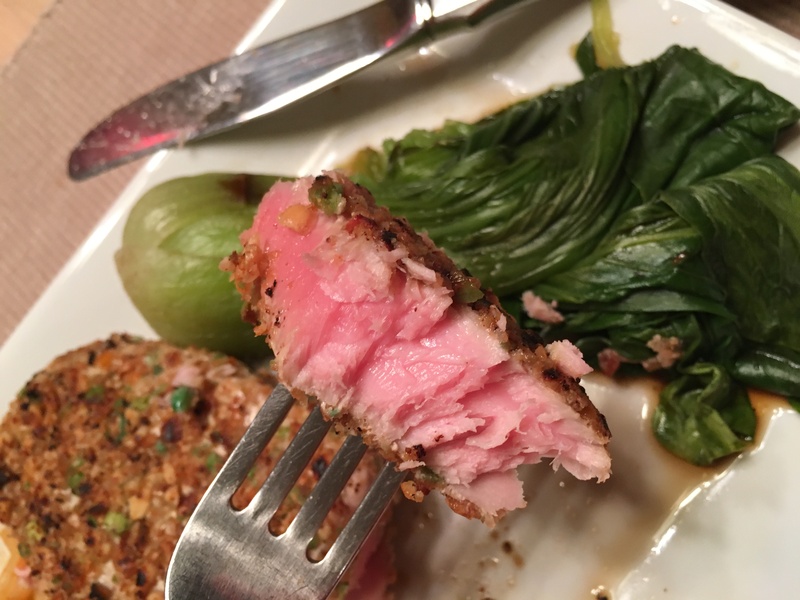 I like my tuna steaks with a crust and light sear and a bring pink middle. I never want it grey and dry all the way through. It needs to be watched closely while you sear it. This perfectly pink bite almost didn’t get to be in the photo! 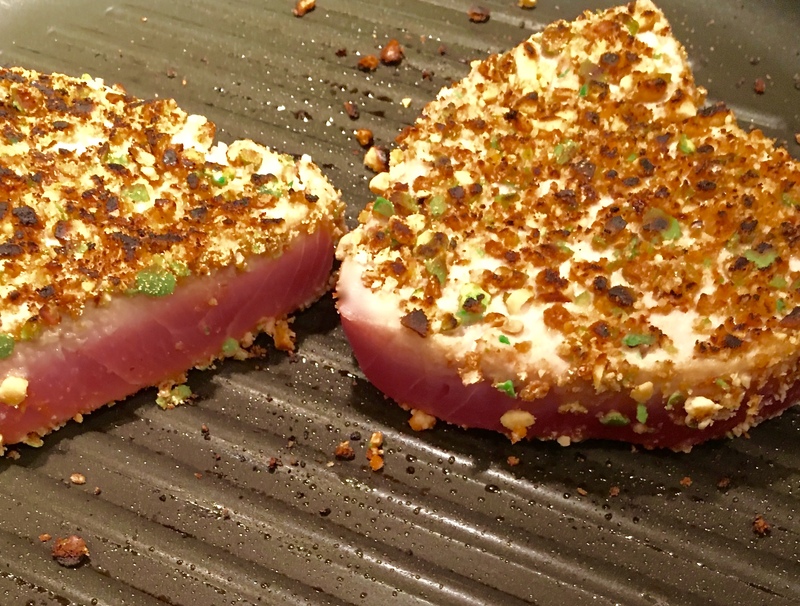 Searing tuna is very simple and the results are wonderful. Just keep an eye on it and don’t overcook it. The New Year has been very busy. Even though it is well into February, I want to share my holiday season. Last December (2015) I went to Denver for a week at Christmas. It was a great time with my daughters, Mande and Emily, that passed too quickly. Now that both girls are in Denver, visits will be easier to coordinate than when one there and the other in Austin. My almost a vegetarian week started immediately after Mande picked me up at the airport. We went to Emily’s apartment and we decided to go to the neighborhood pizza joint for dinner. Denver had had a heavy snow the week before and there were a few icy patches left in shadowy places and some snow plow drifts here and there. We hiked through a dark alley with icy patches as a short cut to the pizza place. Just what a desert dweller with no real boots for snow needed to experience in the dark! We made it safely to the restaurant. It was dark wood charming and had been there a long time. It was obviously a neighborhood favorite. We enjoyed a very good vegetarian appetizer and veggie and cheese pizza made even more tasty by a few good beers. When we left the restaurant, we took the long way back to the apartment on the sidewalks, rather than through the icy alley. Emily had to work the next day, so Mande and I did some errands and then drove to a grocery store that caters to a Mexican-American neighborhood. 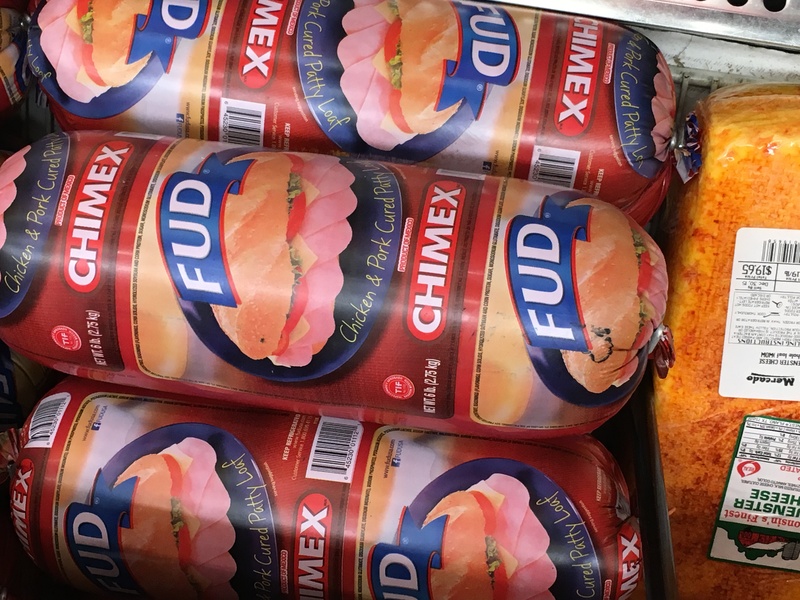 I felt like I was back in El Paso and recognized many of the same products and brands my local stores carry. We were there to pick up ingredients for a new recipe I’d been working on for nopal (prickly pear cactus) enchiladas. This store carries fresh, sliced nopales and frozen green chile. We were well on our way to dinner! We recognized the brand, but didn’t buy the product! I showed the girls how I sauté the sticky sap off the diced cactus. We thawed and squeezed the water out of the chile, chopped onion and garlic and grated cheese. A sweat for the onions and garlic, and the addition of cactus and chile and the assembly began. Another trick for the girls was making pickled red onions to garnish the finished casserole. Heated through and cheese melted, sprinkled with chopped cilantro, the enchiladas were attacked by a hungry vegetarian and the carnivores. Cactus enchiladas with pickled onions and a nice salad for dinner. We are chimeras chile eaters) and proud of it! 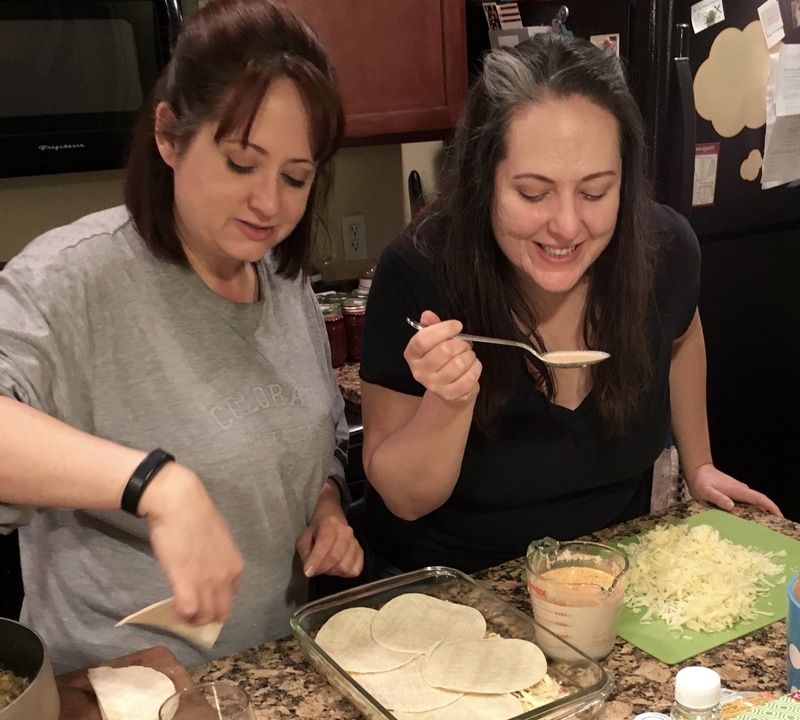 The girls made and canned red chile sauces to give special friends for Christmas. 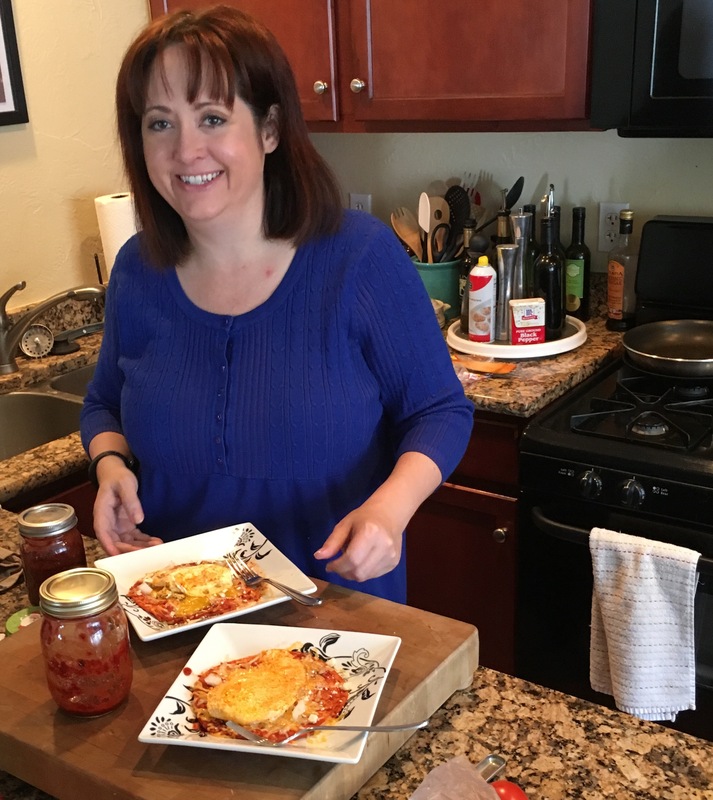 I got to sample it as one of my favorite breakfasts- red enchiladas montadas (it means stacked, not mounted) topped with a fried egg! Lush. Enchiladas montadas (stacked) with egg. A favorite breakfast treat! Emily was off the next day, so after we all went shopping, she made Reuben sandwiches for dinner. Remember, Emily is the vegetarian. No corned beef or pastrami on her Reubens! The protein was tempeh – a mystically transformed soybean pseudo-meat that when seasoned and browned and actually very good! 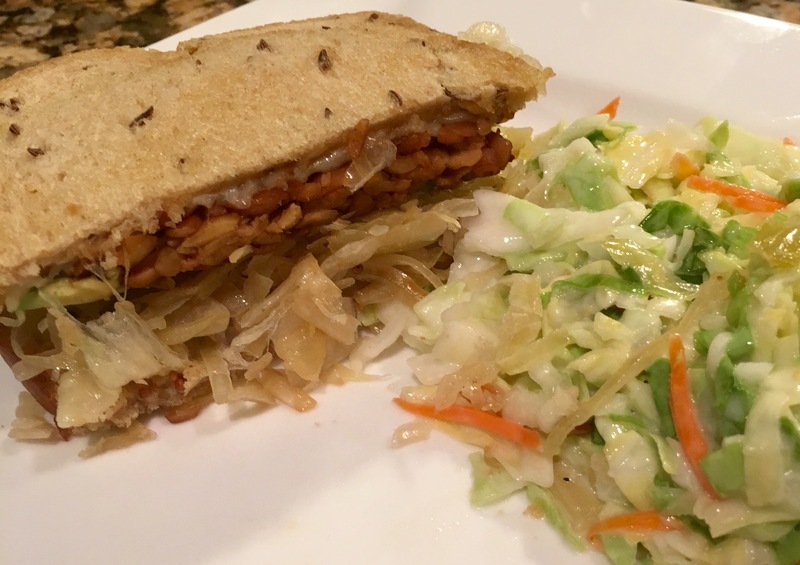 Tempeh, sauerkraut and mustard on rye and coleslaw on the side was great. Tempeh Reuben sandwich on rye with a side of coleslaw. Who needs corned beef? Christmas Eve was a culinary adventure. 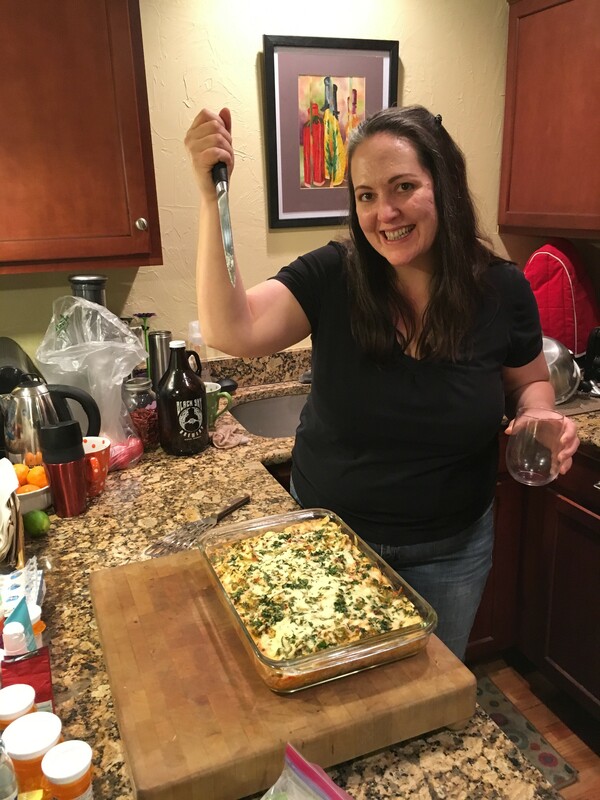 Mande and I made a Vegducken – a vegetarian take on the three-fowl stuffed Turducken. 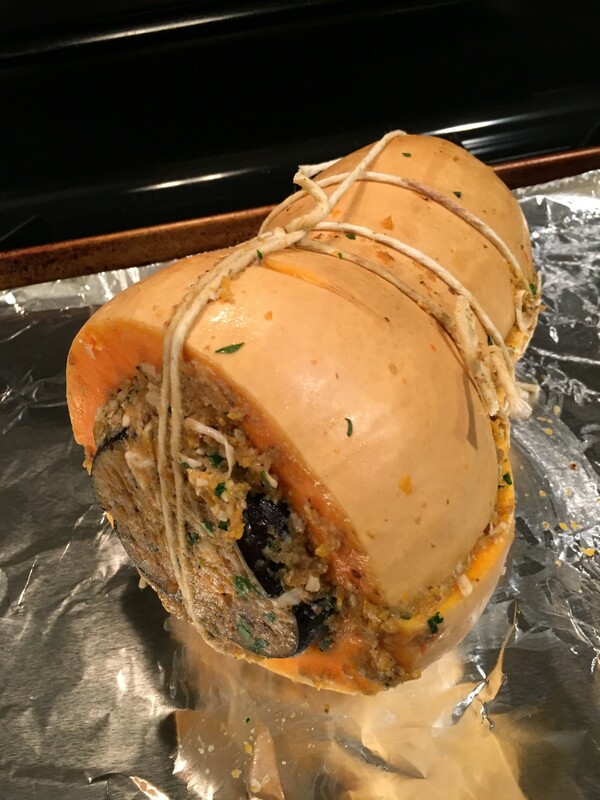 We used a butternut squash, an eggplant and zucchini layered and stuffed with trimmings from the vegetables, minced mushroom and butter. All trussed up, it was impressive! Fitting the squashes and eggplant for the vegducken. Vegducken all trussed up and ready to go. While the vegducken roasted in a crockpot, we picked up our friend Callie, had a quick brewski and went to see the light display at the Denver Botanical Garden. Light displays at the Denver Botanical Garden set off the holiday mood! Christmas Eve Dinner untied and served. The vegducken was worth the work! A champagne toast celebrated a beautiful Christmas season with my wonderful daughters, and hopefully the start of a new tradition of holiday togetherness. The vegducken made a delicious savory Christmas Eve dinner well worth the effort! Christmas Day was lunch out and a light dinner. I enjoyed pork belly and egg on pita points. I love pork belly and sadly have to say there wasn’t enough on the serving to offend any of the noncarnivores in the room. Delicious lunch. Great flavors, perfect egg. There is never enough pork belly! The day after Christmas, I woke weak and trembly. I knew what I had to do. I dressed and braved the morning chill and icy patches on the sidewalk and the parking lot. I made it in one piece to the McDonald’s around the corner. Bacon and sausage biscuits got Mande and me set for the day. Maybe the Mickey Dee munchies were related to what Santa left in my stocking. You don’t see these suckers in Texas! No photographic evident of the meat run exists. Mande treated me to a fabulous seafood buffet on Sunday. Oddly, Emily declined the pleasure. She did get her turn. For dinner that evening we has polenta topped with steamed greens and poached eggs. Emily’s first attempt at poaching eggs was a success! On my last day in Denver, Mande poached eggs and served them on green chile and cheese polenta. Another poaching success! It was an incredible week with my kids. Good times together doing fun things, trying restaurants new to me, enjoying time with the girls’ friends and the three of us loving cooking together. I survived almost being a vegetarian for a week! My first night back home, it was a satisfying steak and potatoes.